A driver makes a right turn at Queen and Geary. One of the cameras watches traffic on Queen. Red light cameras are under fire across the country, but not so far in Albany or elsewhere in Oregon. A closer look is in order. What do those other states and cities know that we don’t? Albany has cameras at only one intersection, Queen and Geary, even though a website for GPS users claims there are cameras at 10 others. I often approach Queen from the north on Geary, planning to turn right. Even though I could turn on red, I don’t, and this occasionally causes impatient drivers behind me to honk. But I don’t like to be surveilled, and if I turn on red, I think the camera will take a snapshot and someone will review whether I was properly stopped before moving. So I wait and avoid being photographed at all. 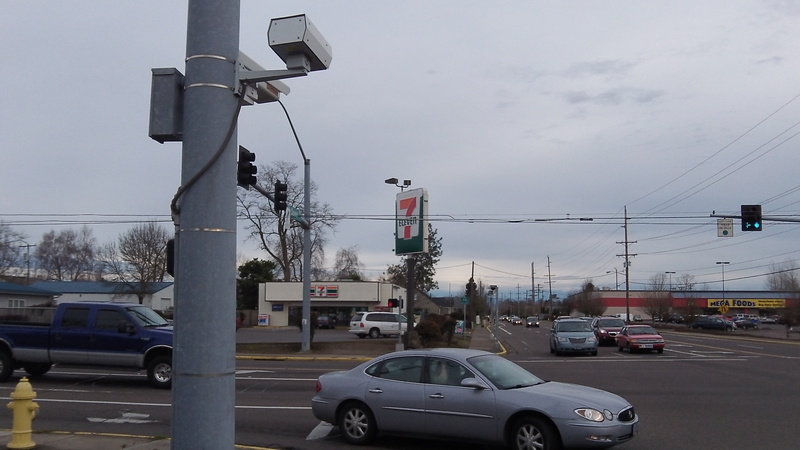 Cameras are supposed to reduce red light running and thus improve traffic safety. They’ve also proved lucrative for some jurisdictions, but not necessarily in Albany. The city’s red light camera contractor, Redflex, averages $60 for every $260 citation that’s upheld and paid, and the city gets the rest, collecting $32,500 in fiscal 2014. The police department tells me that red light camera citations numbered 499 in 2013 and 500 in 2014, a remarkably consistent pace. Crime analyst Pat Hurley points out that not all citations result in a fine being paid. “Citations can be dismissed by the judge as well as through the certificate of innocence process,” he says. The amount of city revenue suggests that only about one-third of the citations issued are upheld in city court and paid. That seems to represent a good deal of superfluous work for everybody including, especially, those motorists who get tickets that are then thrown out. Elsewhere, other issues have caused governments to rethink the use of red light cameras. In Missouri last year, an appeals court deemed the program to be unconstitutional, with the result that in Kansas City alone, some 200,000 drivers are in line for at least partial refunds of fines they had paid. In New Jersey, red light cameras were shut down last month after the legislature decided not to reauthorize them. In Arlington, Texas, (which like Albany had authorized the cameras in 2007) opponents just announced they collected enough signatures on an initiative banning their use. The election will be in May. In a small town in Florida, a similar initiative is pending, and the red light camera industry is girding for a fight. The website AutoBlog just reported on a new study by the Texas A&M Transportation Institute, which analyzed accident data from 90 intersections with cameras in Chicago, which runs the biggest camera program in the country. The study found that crashes had increased overall, and while right-angle crashes went down 15 percent, rear-end collisons jumped 22 percent. The Chicago Tribune discovered that the city had shortened the yellow period on signals to less than 3 seconds, the minimum according to federal standards. In Albany, the Democrat-Herald reported in 2013 that at Queen and Geary, there had been “no significant impact on the number of traffic collisions,” one to three annually from 2003 to 2011. But last month, Officer Aaron Davis told the city’s Bicycle and Pedestrian Commission (according to the minutes) that the red-light cameras at Geary and Queen had resulted in an overall reduction of collisions. Questions the council might want to ask before renewing its contract with Redflex (the current one expires in 2017): Is there a demonstrable increase in traffic safety? And does the rate of citations being dismissed — apparently more than 60 percent — reflect an unreasonable amount of unjustified hassling of drivers using that intersection to get across town? I prefer Glenn Greenwald’s view. Proponents of government surveillance always trot out the argument that “if you have nothing to hide you have nothing to fear.” Would these same folks allow a private citizen to conduct the same surveillance? If it’s too intrusive for private citizens to monitor your behavior, it is even more intrusive (and dangerous) to tolerate a government doing the same. We are not made safer by government surveillance. We are only made more dependent and less free.